The debate on linking rivers is not new. But has politics trumped science and economics in the Rs 11.2 lakh cr project. Roop Singh Bodana, resident of Songuradiya village in Madhya Pradesh's Indore district, is tearyeyed. "Kshipra aur Narmada maiya ka milaap... chamatkaar hai," he says (the meeting of the Kshipra and Narmada rivers is a miracle). The 50-year-old believes that it was foretold in scripture, and therefore inevitable, and that taking a dip in this water will lead to salvation. Bodana is not alone. 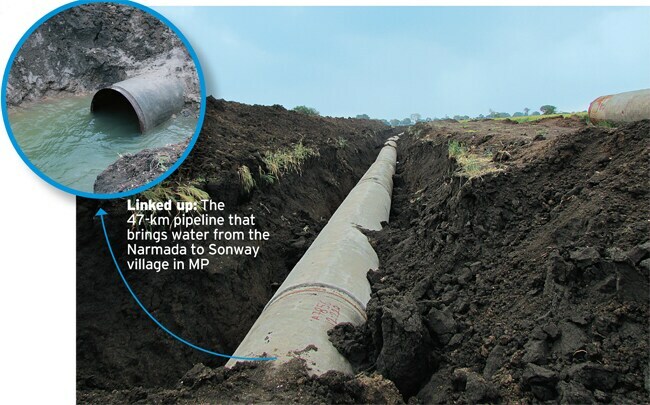 Villagers from all over the district are flocking to Sonway village, to take a holy dip where water from the Narmada emerges from a 47-kilometre pipeline. A local entrepreneur has set up shop in an unused pipe segment, and is doing brisk business selling coconuts, incense, matches, and other paraphernalia for worship. 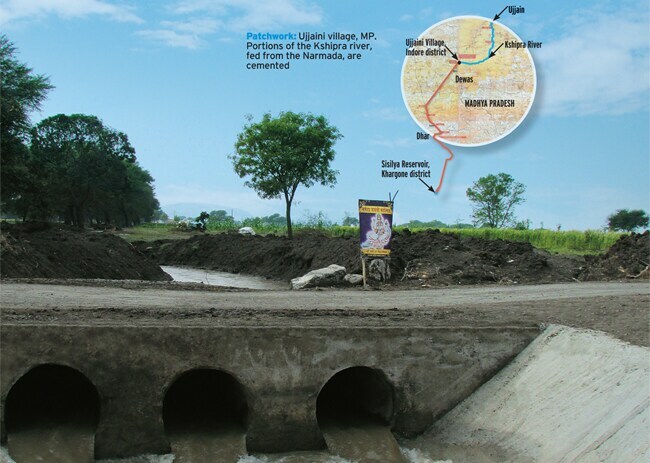 The MP government claims that this is India's first river-linking project, and its inauguration at Ujjaini village on February 25 was attended by a galaxy of BJP leaders and yoga guru Baba Ramdev, amid fanfare and prasaad distribution. Chief Minister Shivraj Singh Chouhan says his government is committed to river inter-linking projects. "From the government's side, there is no dearth of money for such projects," he said at the inauguration. "We will soon link the Kali Sindh, Gambhir and Parbati rivers in phases, which will be a boon for farmers." The day's event was not a political platform, but the fulfilment of the dream of former prime minister Atal Bihari Vajpayee, Chouhan told the crowd of nearly 10,000 at the event. Four pumping stations draw 5,000 litres of water every second from the Narmada-fed Sisliya reservoir in southern MP, and pipe it to Ujjaini village, Indore district, the origin of the Kshipra. The site of the confluence has been designed for pilgrims to bathe. The Rs 432-crore project aims to provide drinking water to more than 250 villages in Ujjain and Dewas districts, as well as to industries there and in Pithampur town. Chouhan says there will be enough water for the Simhastha Kumbh Mela in Ujjain in 2016. He adds that the project will also address fears about the desertification of the Malwa region. The immediate impact of the project is, however, quite different. An estimated 4,000 people visit Ujjaini daily, and it has quickly become a pilgrimage site. On Mahashivratri (February 27) alone, between 20,000 and 30,000 people took a holy dip. The price of land in and around Ujjaini has quadrupled. Even so, critics of river-linking argue that it is an intervention in the grand design of nature, and that its touted benefits are an illusion created in the mind of the public. Indore-based Dinesh Kothari, who works in the area of sustainable development, argues that water is in fact plentiful. He quotes a local saying: "Malav bhoomi gahan gambhir, pag-pag roti, dag-dag nir" (Malwa is so rich that you can find food and water at every step). He says: "Malwa's topography is undulating, and it is famous for its grasslands. That's why it is known for its wheat and pulses. Undulations and grass help store water naturally, which is further taken care of by the region's numerous rivers and nullahs." He says the Narmada-Kshipra project will be a white elephant. Vinod Parashar, Professor at Shri Govindram Seksaria Institute of Technology and Science, Indore, agrees. He estimates that at today's rates, the annual running cost of the Narmada-Kshipra project would be Rs 70 crore. "What will its economic feasibility be, and who will pay for the electricity for pumping the water? And this is just for phase one. The government plans to extend it to other rivers and provide water for irrigation." He says that with such costs, irrigation will not be able to marginally recover even the running cost, let alone the project establishment cost. Besides economic costs, many are also questioning environmental costs. Activists say that the impact on the Narmada and the region's ecology is being ignored. They say that with numerous dams and large amounts of water being channelled out of the Narmada, its survival is threatened. The MP government, however, thinks differently. Rajneesh Vaish, Vice-Chairman of the Narmada Valley Development Authority (NVDA) says Ujjain has suffered severe drinking water shortages. A few reservoirs have eased the problem somewhat, but all is still dependent on the scanty rainfall in the region. He says: "A dam costing Rs 400 crore was proposed at Sevarkhedi on the Kshipra river. Protests by farmers whose land would be submerged, and the rising cost of land, made it impossible." He says if this dam were to be built today, the cost of land alone would be higher by Rs 200 crore, and the dam could ultimately cost about Rs 700 crore with no guaranteed time frame, given the history of anti-dam agitations in MP. "So the Narmada-Kshipra link l replaces this project well," he says. "We have to take into account that with the increasing population and the Delhi-Mumbai industrial corridor being set up in Ujjain, existing resources are getting further stressed." Most villagers in the region are oblivious to all these calculations. Shyam Choudhary, a resident of Piwday village in Indore district and a member of the Kshipra Punah Prawah Abhiyan (project to revive the Kshipra) is elated. He says Narmada maiya (mother) can never run out of water, even if it feeds other rivers. "Kshipra maiya will flow through the year now," he says. "Fed by monsoons, it used to run dry after January or February." He does have a grouse, though: that the NVDA, which implemented the linking project, did so in an arbitrary manner, without participatory decision-making. "The river path that has been dug passes through farmland, and is causing water logging due to seepage," he says. "If it rains even a little, the water overflows and there is massive seepage, which destroys crops. We are requesting the government to cement the river path as soon as possible, to reduce seepage and save the crops." This situation would not have arisen if the residents of the Kshipra valley had been consulted in an social and environmental impact assessment, he says. NVDA's Vaish says that digging is restricted to approximately the last seven km of the linkage. This used to be a small rivulet, and now it is wider. "Farmers had encroached on it and we have revived it. We plan to line it with cement to prevent seepage into fields." Some, such as farmer Anil Choudhary of Piwday, think that is a bad idea. He says: "When have river paths been cemented? Rivers are meant to flow naturally, and seepage is good to increase moisture in the soil." Others argue that the river's path has been dug, and is not natural. So debate and protests are brewing in the area, and the channel is cemented only in parts. Villagers say the confusion has resulted in labourers sitting idle. The idea of inter-linking rivers has got a renewed thrust with the BJP's prime ministerial candidate, Narendra Modi, underlining its role in development at various forums and as part of his economic vision. However, he has not clarified how the actual transfer of water would take place. Many point out that Modi is merely following a legacy, and is not the only one to do so. At the inauguration of the Narmada-Kshipra project, senior BJP leader L.K. Advani too spoke about the vision of Vajpayee, who was moved by the plight of droughtstricken farmers. He said: "Vajpayeeji used to say that India has so many rivers, and if we can inter-link them and transfer water... to water-deficit rivers, drain flood waters and provide irrigation in the dry season, it would be miraculous." He highlighted the efforts of the task force led by former power minister Suresh Prabhu to work out modalities under the former BJP-led government, and added that the present government has taken no initiative on it. Since 2004, the UPA government has indicated a lack of interest in the project. Ramaswamy R. Iyer, former secretary for water resources in the central government, says the UPA's Common Minimum Programme promised the project would be comprehensively addressed in a consultative manner. "Both UPA-I and -II have refrained from formally abandoning the project, doubtless for political reasons, but have deliberately chosen to let it languish," he says. 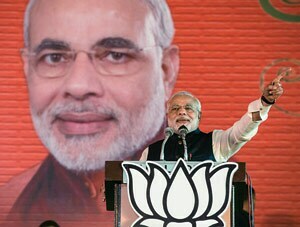 Narendra Modi, too, highlights UPA inertia. For instance, at a rally in Guwahati on February 8, he said: "Atalji's river linking project was a dream to solve the flood and drought crisis from the country. After the PIL filed in Supreme Court, the court rebuked the Manmohan Singh government to file a status report... but... the government took 15 months to form a committee.... At this pace the government is working." 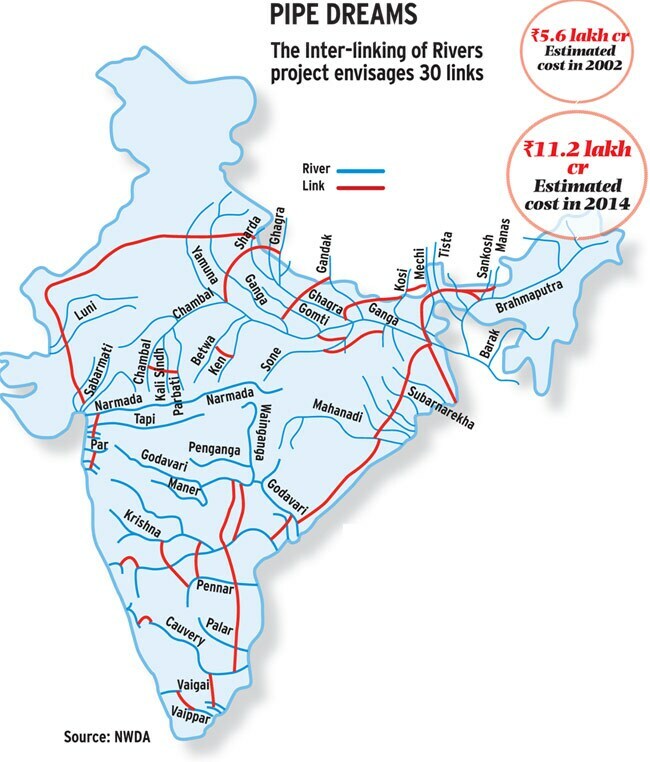 The current avatar of the 150-year-old idea of linking rivers envisages 37 rivers being connected by 30 links - 14 in the Himalayas and 16 in peninsular India. The links, consisting of dams and canals, would seek to permanently resolve the paradox of floods and drought. But what some tout as visionary nation-building has not taken off, because the project depends heavily on the interstate linking of rivers, and the ground reality of politics is that no state can afford to give water to another. Water is a state subject. Himanshu Thakkar, coordinator of the South Asia Network on Dams, Rivers and People, says: "States are getting powerful, and water is becoming scarcer and an emotive subject. Elections are going to be fought and lost on water issues in the future." He says the subject is so sensitive that even states where the same party is in power do not agree. He gives the example of BJP governments working at cross purposes in MP and Rajasthan. For the Parbati-Kalisindh-Chambal link, even as consensus-building is under way between MP and Rajasthan, the MP government has started work on Mohanpura and Kundaliya as standalone projects. They were originally part of the Parbati-Kali Sindh-Chambal interstate project. "When we highlighted it, the MP government clarified that it has not accepted the NWDA [National Water Development Agency] scheme, and is not likely to be implemented in the near future. And the MP government wants immediate implementation of the Mohanpura project." A.C. Kamaraj, expert member on Inter-Linking of Rivers (ILR), Government of India, says that for the ILR, all states must not only agree to the proposal but also accept the quantity of water that they can spare as surplus. However, he says, these possibilities are remote. "This is the reason for the abnormal delay in going to the next step of the Detailed Project Report, or DPR, for many links whose feasibility reports are completed." No wonder, then, that out of 30 interstate links, only one DPR has been prepared - for the Ken-Betwa link (MP and Uttar Pradesh) is ready. Only two MOUs have been signed for other DPRs (Par-Tapi-Narmada and Damanganga-Pinjal projects, both involving Gujarat and Maharashtra). For the Netravati-Hemavati link, Karnataka has not even given permission for a feasibility report. For the Godavari-Krishna link, the Andhra Pradesh government is implementing its own plan. Thakkar says the Centre has been trying to make water a concurrent or central subject, but this is unlikely to happen. Many experts say state governments will focus on intra-state linkages, such as Narmada-Kshipra. For Bihar, the NWDA has prepared the DPR for the intra-state link for Burhi Gandak-Noon-Baya-Ganga, and the Kosi-Mechi DPR is in progress. The NWDA, set up in 1982 under the Ministry of Water Resources to study the feasibility of inter-linking, says the programme will increase irrigation potential from 140 million hectares to 175 million hectares, and generate 34 million KW of power, in addition to benefits such as flood control, navigation, water supply, and salinity and pollution control. NWDA Director General S. Masood Hussain says India needs water for food security. "The linkages are designed based on techno-economic criteria," he says. "For irrigation alone, the benefits are 1.5 times the cost. Most of our rain water flows into the sea, and is not utilised. We witness yearly floods in eastern UP, Bihar, West Bengal and Assam, with no storage infrastructure, and all that water is wasted." The logic seems impeccable, but Planning Commission member Mihir Shah points out that damming rivers cuts down the sediment supply and destroys fragile coastal ecosystems. "It can affect the monsoon system," he says. "Rainfall over much of the subcontinent is controlled by a layer of low saline water. A disruption could have serious longterm consequences for climate and rainfall." He says the 12th five-year plan has taken the official position that a programme of this scale will be a huge disaster. India's dependence on the monsoon is immense. Experts point out that rivers generally overflow during roughly the same time across the subcontinent, so it's questionable why a flooded basin would accept more water from another basin at such a time. Environmentalist Vandana Shiva points out that the Uttarakhand disaster was aggravated by hydroelectric projects. She says the ILR project lacks hydrological and ecological soundness, and seeks to commodify India's water. "I have done detailed studies of the Ken-Betwa link and the Sharda-Yamuna link," she says. "The false argument that water will be taken from regions with floods to regions with drought does not hold. When there is a drought in Bunde-lkhand, both Ken and Betwa have reduced flow.... When the Sharda is in flood, the Yamuna is in flood." Many experts also question whether a project of this magnitude is executable. M. Inamul Haque, Chairman of the Institute of Water & Environment (IWE), Dhaka, says that it is impossible to complete a project of this magnitude. "The inter-linking project has 30 canal systems," he says. "Hydraulic mass has a natural tendency to flow downwards. River basins are created out of that tendency." He adds that the sustainability of diverting it for unnatural demands is doubtful, and ruins of abandoned big or small dams are found all over the world, including India. "So, this high-sounding inter-linking project can start somewhere, but will be stuck with its own problems. Diversion projects will have high evaporation loss on exposure, and high conveyance loss by seepage.... structures will fail to deliver lateral flow against gravity, leading to clogging and high maintenance costs." NWDA affirms that all environmental impacts are assessed and remedies suggested in the DPRs, but observers point out that impact on people and ecology, upstream and downstream, has not been factored in. Activists say the project involves 200 large reservoirs, a network of 60 to 80 dams, and canals, which will lead to massive displacement and devour cultivable land. It will aggravate floods and drought by destabilising water flows, and block natural drainage, further hampering agriculture. Environmentalist Shiva says of the Ken-Betwa link: "The project begins in the Panna tiger sanctuary, in the heart of the tiger habitat. The assessment casually states, 'wildlife has legs and will walk away and find another habitat'. The only habitat outside the wildlife sanctuary is villages." The initial cost of the inter-linking project was Rs 5.6 lakh crore at 2002 prices, raising questions about the cost-benefit dynamics of the project. Haque of the IWE estimates that the cost has doubled now. Tushaar Shah, Senior Fellow at the International Water Management Institute (IWMI), says the Rs 5.6 lakh-crore estimate was derived 15 years ago, and that today it would be over Rs 10 lakh crore. "That's close to a full year's GDP," he adds. "Given its magnitude, it would take over 30 years to complete, hence the cost will multiply many times over." Many argue that the costs outweigh the benefits, especially given that there will also be running costs for things such as pumping. Kamaraj, the Expert Committee Member on ILR, says: "A rough estimate shows that these expenditures will be of the order of nearly Rs 10,000 crore a year. Who will bear the cost - the Centre or the states concerned? Besides, will the state that gives water to its neighbour spare the power required for pumping?" And what about the benefits? 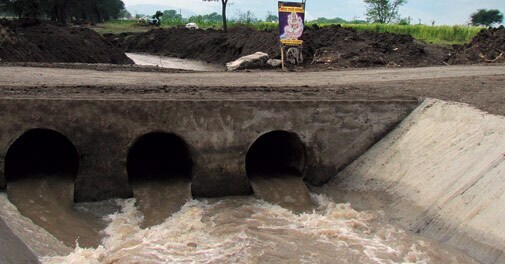 IWMI's Shah estimates that much of the 35 million hectares that the project promises to irrigate is already under private tubewell irrigation, which has proved far more profitable than canal irrigation. "Moreover, lifting... Himalayan water across the central Indian highlands will use up much of the 35 GW of hydropower the project would generate." The net socio-economic benefits seem illusory even with rosy assumptions. Many experts say such programmes result when schemes are formulated on drawing boards, without factoring in ground realities. Thakkar says that despite the fact that rivers are revered in India, as a nation we have not valued our rivers. "Look at the state of Ganga… considered the most sacred…. 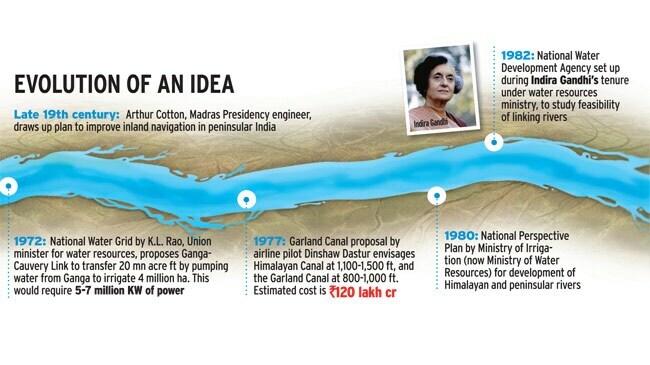 In 1985, the prime minister set up the Ganga Action Plan. It failed. It was converted into the National River Conservation Plan in1995. It failed. In 2009, we were given the National Ganga River Basin Authority under the prime minister of India. The Authority has held just three meetings in the last five-and-a-half years. Maybe that explains everything."